In a time when movie lovers can get their fix anywhere — from iPhones to surround sound theaters — Laurie O’Brien has found a different way to screen films. 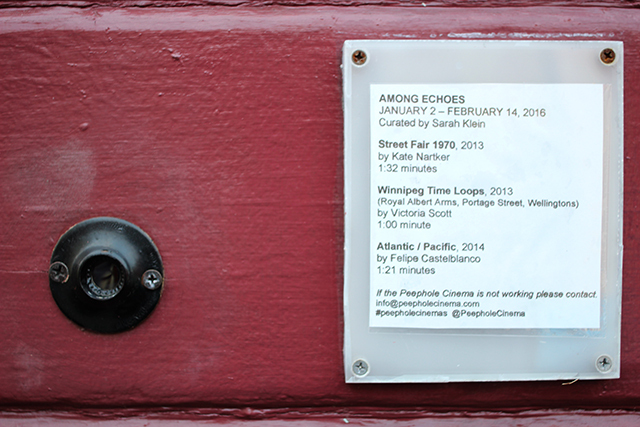 Peephole Cinema displays silent films, each a few minutes in length, 24/7 through tiny peepholes in public spaces. 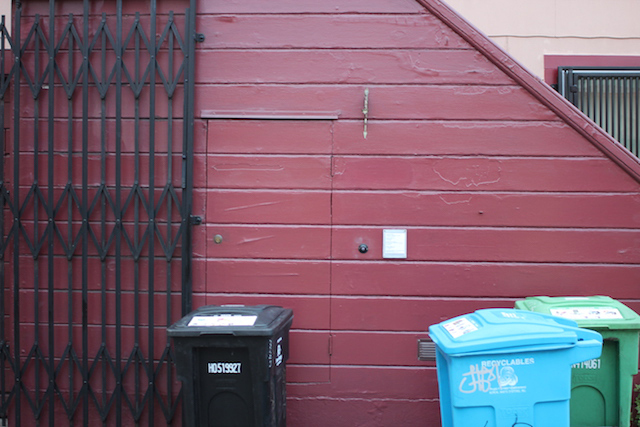 O’Brien, the founder, established the first location in 2013 in the wall of her own house on Orange Alley in the Mission. Since then, she has added satellite projects in Los Angeles and Brooklyn. The current exhibit at Orange Alley, Street Sets, features the work of Eric Dyer, Johan Rijpma, and Caleb Wood and runs from February 15 through March 27. O’Brien started Peephole Cinema as a way to share films, animated and otherwise, with a broader audience than the animators at animation shows. However, the technological logistics of getting the films to run 24/7 was difficult at first. “It has to be the right kind of building,” said Sarah Klein, the current curator of Orange Alley’s Peephole Cinema. The wall of O’Brien’s house allowed access to machinery set up on the inside, Klein explained, and the wall of the exterior staircase flush with the street made the place public enough to avoid suspicions of trespass. Peephole Cinema in Orange Alley. Despite the compatibility of the building with the project, the location is not compatible with a quick Google search for art in San Francisco. “People could miss it ‘cause it’s such a low-profile place,” said Victoria Scott, one of three artists featured in the current exhibit. For those who do find it, the cinema brings a different dimension to the alley, in which Klein said, “It seems like you’re really vulnerable.” The contrast of the public alley with the tiny, intimate cinema makes for a “tension between the public and the private,” said O’Brien. Plus, she added, looking into a peephole for film-viewing subverts the expected custom of looking out of a peephole for security-searching. Felipe Castelblanco, an artist in the current exhibit, called Peephole Cinema an “invitation to engage with the neighborhood in a different way,” deeming the unlikely site “very smart.” “You’re doing something slightly forbidden,” Scott said of the break in routine, adding that the cinema forces viewers to linger and appreciate their environment. Murals may be one of the biggest attractions in the Mission District today, but tiny film screens also have historic roots in San Francisco – one of the first kinetoscopes, a device in which viewers gazed at films through a peephole, was installed on Market Street in the 1890s. “It kind of brings back that feeling of nostalgia,” said O’Brien. The founder’s interest in small viewing devices for all arts, such as dioramas, has origins in her study of animation at Cal Arts. “During that time, I became interested in alternative viewing devices,” she said.